If I want to get inspired by new and cutting edge ideas. 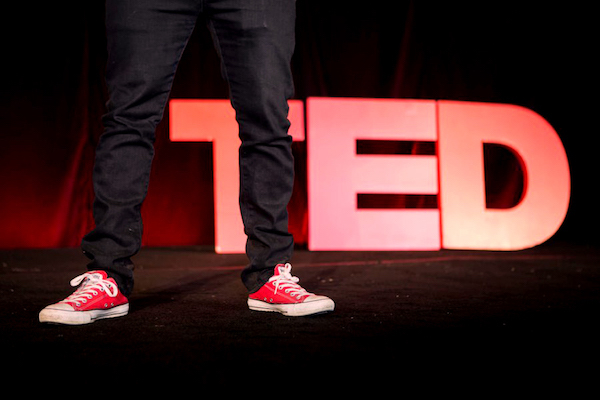 TED is like having access to the best university, the greatest minds and the biggest inspiration in one. In short, I love it. Only trouble is that there are thousands and thousands of talks, so where do you even begin? TED does have some excellent playlists. However, I wanted to speak to what it is like to be a Maverick and some of the obstacles and barriers that Mavericks face. With that in mind, here are 7 TED talks that have inspired us at Mavericks Unlimited and which will help ignite your creative spark...and your Maverick mojo! In his familiar role as one of the foremost modern philosophers, Alain De Botton questions our modern take on success and failure. His suggestion is that we actually define success in finding deep and true pleasure in our work. Definitely a more human and more Maverick definition of success. Scott Dinsmore was tragically killed on an expedition climbing Kilimanjaro in 2015. However, he had already built a global tribe at Live Your Legend around one idea - change the world by doing work you love. The notion that how you contribute to the world is through your passion is central to our philosophy at MU. A great talk by a great guy. A real call to arms! Tim Brown suggests that in the modern world, we are obsessed with "stuff" that is cool and fashionable because it is designed. Instead, he challenges designers (and the rest of us) to apply principles of "design thinking" on a much bigger scale, for example, to tackle global access to clean water. Challenging stuff delivered in an earnest and inspirational manner. Derek Sivers has to be one of the nicest AND wisest multi-millionaire businessmen on the planet. In this short talk, he demonstrates that the most important person in a movement is NOT the leader. Something worth thinking about for every Maverick. David Brooks - Should you live for your resume...or your eulogy? This talk is only 5 minutes long but touched me more than almost any other TED Talk...and is much deeper than it's length might suggest. Treading the path of the Maverick is often about the internal conflict that David Brook refers to. Just watch it and see...he does a much better job of explaining it than me. If you have read or heard of the book and film "Eat Pray Love", yes it is THAT lady. Liz speaks about the pressure to come up with a sequel to such a global phenomenon and how the sequel actually flopped. Her answer? Find that best, most worthy thing in the world that you love more than yourself and "build your house right on top of it". A true testament to the power of how to keep going when the going gets hard. Ricardo Semler wrote the book "Maverick" in 1993 when he espoused some radical ideas around corporate democracy, employee participation and the meaning of work. More than that, he ran his multi-million dollar business on these ideas. Without Semler there probably wouldn't be Frederic Laloux, teal organisations or even employee benefits like unlimited vacation. A Maverick's Maverick. Leave us a comment below and tell us what piece of wisdom you have taken from these talks. How are you going to apply that wisdom? What is your favourite TED Talk?